Many of you might have seen the man with the two mules (he used to have three) walking through Claycord this weekend. Our friend Jennifer Jay gives us more information on this man…. 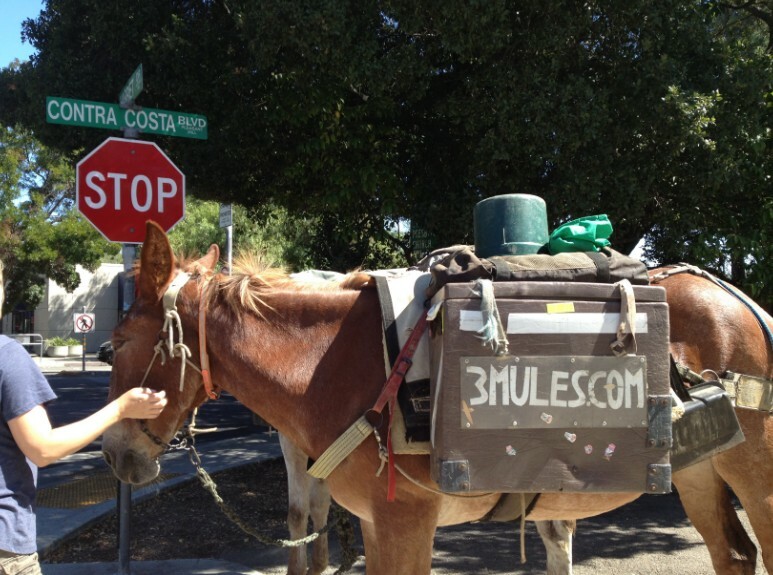 His name is John Sears and his two mules (aka Three Mules) are currently passing through Claycord, en route to San Francisco to bring attention to the subject of public space. He last passed through Claycord two years ago. John is currently trying to get 100,000 signatures by October 1, 2014 for a petition to the White House to implement a nationwide multi-use trail system. HERE is the link to the petition. Currently, he has 484 signatures and needs 99,516 signatures within the next two weeks in order for this petition to get in front of the President. John has been walking for over 30 years. The Daily Republic newspaper in Fairfield did a great piece about John. Please click ON THIS LINK to read the article. I saw him in Benicia on Friday, How did he get across the bridge? So, where is the third mule? I saw him in Martinez, Saturday. Should I buy him a hamburger? This guy is off his rocker. We already have enough police agencies with too many miles of residential, commercial, city, highways and Interstates to patrol. Last thing we need is another LE agency, emergency services, upkeep etc on these trails. Imagine the cost to make the trails meet DOT Regulations: markers, lighting, safety rails, drainage, paving and the list goes on. This comments to follow are sure to be interesting. The Benicia bridge has a pedestrian path on the west side. Try it some time, noisy and windy and not very pleasant. I like the idea in theory, like what he’s doing with his monthly check, however 484 signatures reflects my opinion best. If the multi-use trail he is trying to petition for is a footpath used by walkers, packers, horsebackriders, cyclers, and not motorized vehicles, I think its a good idea. Get some fresh air, and stray from the pavement. @5. No, no interesting comments to follow. Your comment was sufficiently interesting to negate the need for any more. I think this is pretty cool! Good for him!!! At least he’s trying to better the world. I pray that he and his mules stay safe!!! Can someone help me? How do I share this story on my Facebook page? His campaign reminds me of the Natchez Trace. anybody know if it still exists? demeaned by the left, celebrated by the right. Let me get this straight, I need to go to the internet to learn about he man that says he is technology free and living off the grid! Buy the man a hamburger! Compelled to rename myself Sickest Of It. I think this is great! Love the mules. Thanks for doing this and raising awareness John. I remember growing up in Concord we used to see people riding horses occasionally down Concord Blvd or Clayton Road (out towards the Concord/Clayton border). Those were the days! Please no parking lots for the trails, we have enough car thefts. I would be more concerned about the fleas, ticks and diseases they would be spreading. Is this ok with the health department? So is this guy homeless or does he have a trust fund? It was sad to see the 3rd mule had died… such is life..
Marissa, news flash, 99% of the food we buy from grocery stores and restaurants is produced in horrific conditions, with diseased animals fighting for space with the dead ones and feces, blood, and flies everywhere. We have open borders and now we have TB again. Cats overrun our suburbs pooping cysts all over the yards where our children play. I think we’ll be fine with some old dude with BO leading a couple mules around. Let’s really hope the products in Safeway is not disease infested. @John H. Sorry to hear that too, but it is a mule and a life form and it is the progression in life. I don’t mind his wandering either. Why not? He isn’t begging and seems to be self sufficient. Is he a Vietnam vet?. He doesn’t appear to be on drugs or alcohol. I agree about the over population comment. We are. Headed for…. Thanks #24! Wouldn’t it be col to walk a public trail from the bay to Nevada? I have always envied the Europeans and their walking trails with villages all along the way. Don’t get me wrong, we have incredibly beautiful trails in our country, but they just don’t connect towns, which is good for week-end rather than weeks-long walkers. I suspect he’s had a more interesting life thanks to walking than most people have sitting all week in cubicles. Frankly, I envy his freedom. Most horses and mules, which are healthy, do not have a parasite or tick infestation. And Marissa, mules don’t get fleas. ph res, the do get fleas and lice. Saw him on Marina Vista in Martinez under the 680 overpass on Sunday morning about 10am. He and his mules where heading east, made me do a double take. I too wish him and the mules well. So cool. Saw him downtown WC Target parking lot around noon ish! The kids thought it was pretty cool! I’ll take the old guy and his mules in my town any day over the scum who break into our cars and homes and steall stuff. Those folks can just go somewhere (preferably to Hell) else forever as far as I’m concerned. I saw them by the lot next to St. vincent De Paul’s Sunday. It was cool. The mules were eating weeds. What precious mules, give the man a hamburger. What a worthwhile cause, more power to this man. I signed this petition did anyone else sign it? 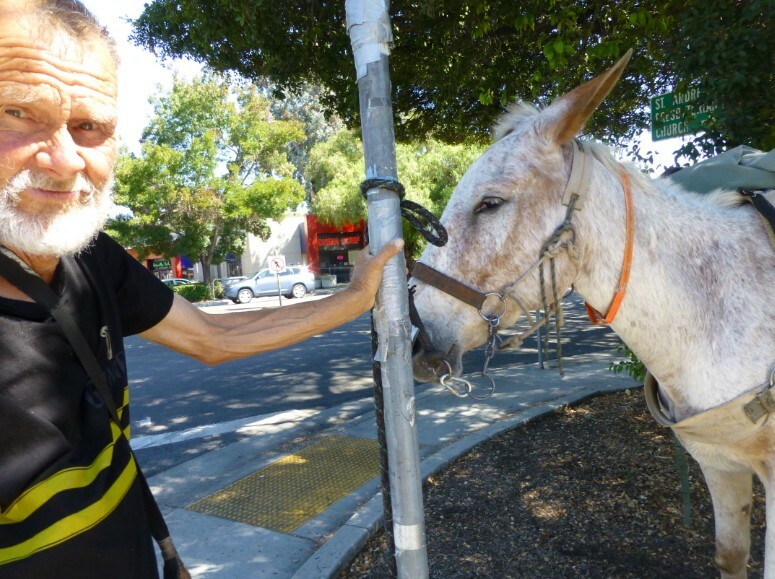 A local author wrote this terrific article for “The Atlantic” about the Three Mules when they came through the Bay Area last year. I have been following them on Facebook ever since. It was fun to see them visit my old stables in Huntington Beach and it was sad to see them get ticketed in San Luis Obispo. I was excited to see that they were in Pleasant Hill. I’d love it if he made his way to Clayton! We have a lot of good mule rest stops here! Has he traveled any part of the American Discovery Trail? This is an awesome coast to coast trail. I would love to see some government funding spent on upgrading this trail. Clayton Squirrel, That’s a great article, thank you. I have been following The Mules for my documentary for 20 months with over 150 days of filming. Please take a look at some of the footage at 3MulesMovie.com or on the Mule Documentary FB page. Thanks. I just can’t believe he’s walking the trails alone. Not counting the pack mules of course. I saw this guy in Ceres California 2 weekends ago. Saw him today walking south on Saint Mary’s Road towards Moraga. 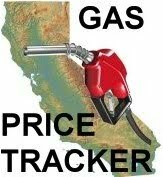 Just make sure the trail goes through more rattlesnake and mountain lion country…. He really does get around, doesn’t he!